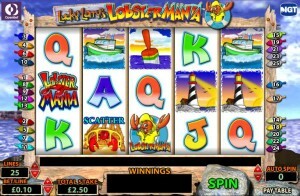 Lobster Mania is a lobster fishing themed slot from IGT, with a rather old design, but with an interesting theme that manages to be interesting nonetheless. The action takes place at sea, with a lobster fishing boat being among the symbols, and with a lobster actually being one of the fishermen, which is a bit weird. The theme being so unique and fun, I don’t mind the low quality graphics as much. Even with the older graphics, you will find that the game is worth pursuing. Payouts of up to $250,000 are possible, with symbols including scatters and wilds. You also have an interesting bonus game which pays well. The game has 5 reels with 25 lines. 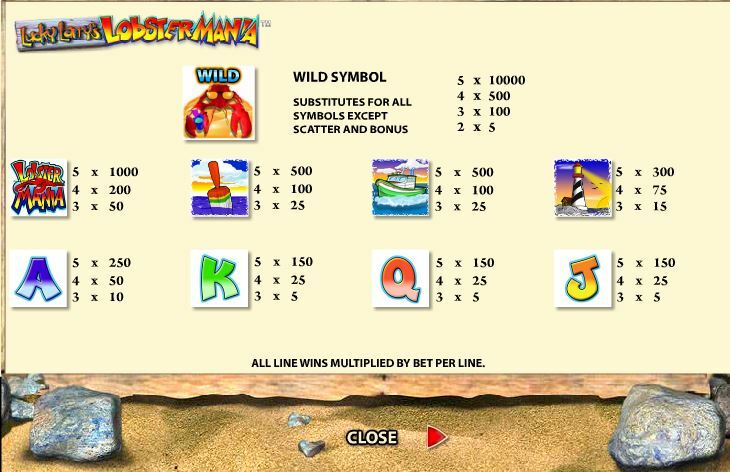 When it comes to the features which are made available to the players, a wild symbol, a scatter and a bonus game are the three options that you will run across while you spin the reels. The Cool Lobster, meaning that it’s wearing sunglasses and holding a drink in one of the claws, acts as the wild element of Lobster Mania. The symbol can obviously substitute for other symbols, for all regular ones at least, and it can also offer some of its own prizes to the players. The highest payout is worth 10,000 coins for five symbols, but you get paid for as little as two. The Trapped Lobster would be the scatter symbol in this case. This symbol has to appear on the reels in at least three positions, and the great thing about it is that it doesn’t matter where it shows up. As long as you have enough of them, you get paid. 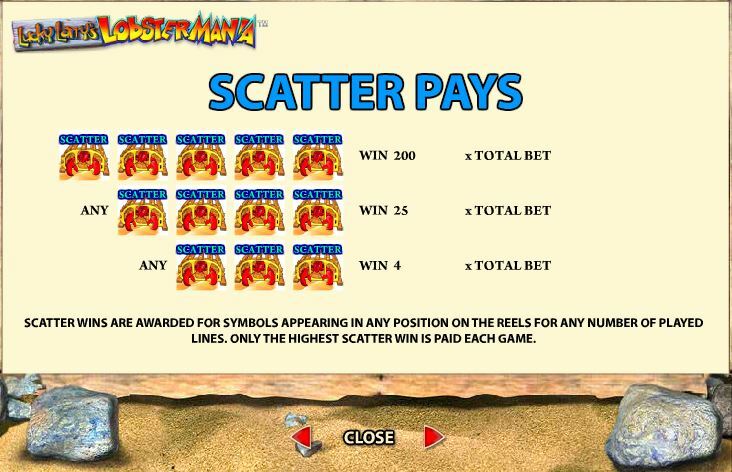 The minimum payout is at 4x the total bet, while the biggest one is at 200x. The Lobster Mania symbol is needed on the same active line, where it has to appear a minimum of three times. 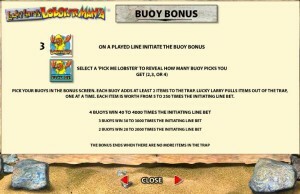 You are asked to choose one of those lobsters, and your pick will reveal how many buoy picks you get (between 2 and 4). 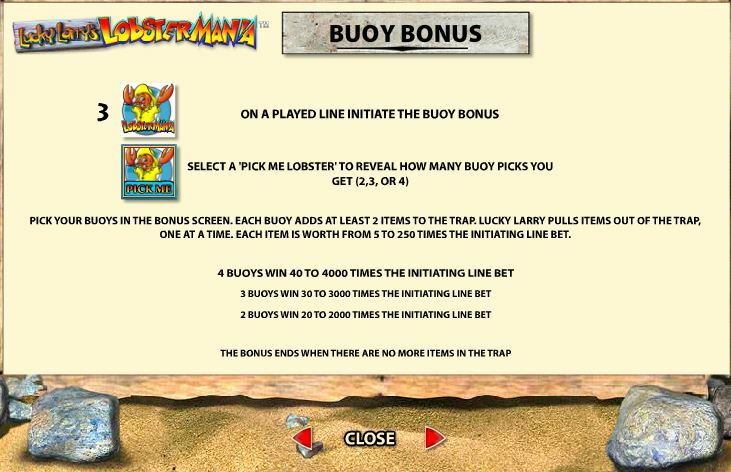 On the bonus game’s screen, you have to pick buoys. With each choice, you get two items added to the trap. For each item, you get a prize worth between 5x and 250x the line bet. Up to 4,000x the line bet can be won through this bonus game, if four picks were awarded to you. 3,000x is the limit when there are three picks and 2,000x for two picks. The bet/line option allows you to wager anywhere between $0.01 and $25. Since you can also use up to 25 lines, the bets can reach a top value of $625, which can be very expensive. 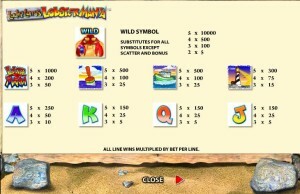 The wild symbol is responsible for awarding the jackpot, giving you 10,000x the line wager. It’s a $250,000 top jackpot, provided that you used $25 per line. The bonus game also pays well, up to 4,000x ($100,000). The design looks like an older one, and the quality of the background image and the symbols is far from impressive. The ocean is visible behind the game area, while on the reels you get playing cards and fishing related images. Wooden boards are used to surround the reels. As I’ve mentioned before, the game looks like it’s going to be fun, and it’s unique as far as I know, so you might want to give it a shot despite the low quality of the graphics. Symbols: Lobster (bonus), Cool Lobster (wild, 10,000x), Lobster Mania Logo (1,000x), Buoy (500x), Fishing Boat (500x), Lighthouse (300x), Ace (250x), King (150x), Queen (150x) and Jack (150x). The big prizes, the features which also pay well, and the fun style in which the game was designed, these are all things that recommend it. The older graphics used might bother some players, but many others will be able to have fun in this game. 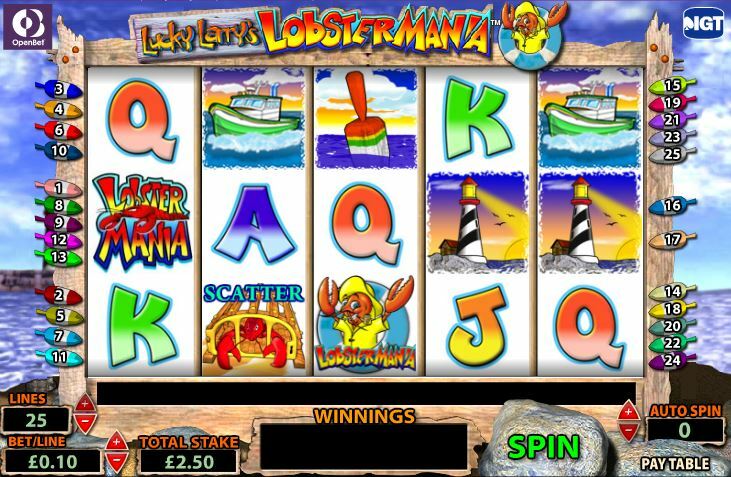 The Lobster Mania slot machine is offered through the IGT platform, so if you want to play it for real or just to practice, look out for casinos that use it.